Figure 8-1. Cross-talk between ethylene and other plant hormones. Selection for altered phytohormone responses resulted in isolation of mutants that have a shared ethylene-signaling pathway. Mutants era3, ckr1 and pir2 selected for enhanced response to ABA, root growth resistance to cytokinin, and N-1-naphthylphthalamic acid (a polar auxin transport inhibitor), respectively, were alleles of ein2. Alleles of ctr1 were isolated among the mutants that showed resistance to high levels of sugar (gin4, sis1) and enhancement of abi1-1 (ABA-resistant seed germination) mutant. gin1 and gin2 affect seedling response to ethylene. Mutations in an auxin amino acid permease (aux1) and N-acetyltransferase (hsl1) disrupted the apical hook formation. Both auxin and cytokinin enhance ethylene production by regulating expression of different members of the ACC synthase gene family. A mutation in ASC5 is associated with resistance to kinetin. Isolation and characterization of additional mutations impacting plant response to growth regulators would help understanding of the molecular circuitry regulating plant growth and development. other molecular tools are helping to unravel genetic circuitries and molecular mechanisms regulating cross talk between ethylene and other plant hormones. Several laboratories have isolated Arabidopsis mutants that show altered response to classical phytohormones in the presence of ethylene (Table 8-1). Molecular characterization of these mutants has allowed identification of a number of genes underlying interactions between ethylene-, abscisic acid (ABA)-, auxin-, cytokinin-, sugar- and light-signaling pathways. Figure 8-1 attempts to summarize information in the literature and show emerging possibilities of cross talk between ethylene and other hormones, including convergence between the ethylene, ABA and sugar at the ethylene signal transduction pathway intermediates, CTR and EIN2. Some of the components of hormonal signal transduction pathways act as central points where signals from different hormones merge and undergo amplification, modulation or attenuation to regulate plant growth, developmental processes, and PCD. The interactions between different signaling pathways are relatively specific, and we are just beginning to understand which hormone response loci are involved in multiple signaling pathways. Studies on additional mutants, including alleles of ein2 in screens involving auxin transport inhibitors (Fujita and Syono, 1996) and cytokinin (Cary et al., 1995) and delayed senescence (Oh et al., 1997) suggest that the ethylene-signaling pathway is likely to intersect with other senescence-signaling pathways as well. In the following sections, we present examples of cross talk existence where multiple hormones control a single process, if not for anything else but to bring to light the possibility that some aspects of ethylene-regulated PCD may indeed be regulated in similar ways. Genetic analysis of Arabidopsis mutants altered in ABA response provided the evidence that the ethylene signal transduction pathway intersects with that of ABA (Beaudoin et al., 2000; Ghassemian et al., 2000). Characterization of suppressor and enhancers of abi1-1, an Arabidopsis mutant showing ABA-resistant seed germination, resulted in identification of alleles of mutant ein2 and mutant ctr1, respectively (Beaudoin et al., 2000). 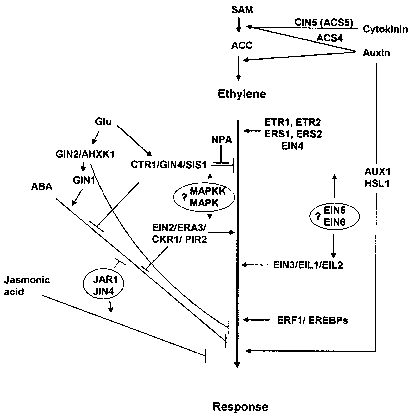 At about the same time, era3 (enhanced response to ABA 3), an Arabidopsis mutant whose seed exhibited enhanced sensitivity of germination in response to ABA, was demonstrated to be allelic to ein2 (Ghassemian et al., 2000). Genetic characterization of ethylene-insensitive mutations showed that ETR1, CTR1, and EIN2 inhibit ABA signaling in seeds. It was concluded that ethylene promotes seed germination by decreasing sensitivity to endogenous ABA. In contrast, ABA inhibition of root growth seems to require a functional ethylene-signaling cascade as the roots of ein2 and etr1-1 are resistant to both ABA and ethylene (Beaudoin et al., 2000). To explain this discrepancy it has been proposed that ABA uses the ethylene-signaling pathway as a surrogate to inhibit root growth only when ethylene is not present (Ghassemian et al., 2000). An additional facet of this complexity is the growing body of evidence that suggests that the sugar-sensing mechanisms play a significant role in regulating effects of ABA and ethylene, particularly during seed germination and root growth, processes that in certain instances involve PCD (Gazzarrini and McCourt, 2001; Rolland et al., 2002). Soluble sugar levels affect a diverse array of plant developmental processes, including inhibition of early seedling growth in the presence of high levels of sugar. Mutants that show either sugar insensitive [glucose insensitive (gin)/sugar insensitive (sis)] or oversensitive [glucose oversensitive (glo)/sugar super sensitive (sss)] phenotypes have been isolated and studied. Molecular characterization of gin4 and sis1, two independent glucose-resistant mutants, revealed them to be allelic to ctr1 (Gibson et al., 2001; Rolland et al., 2002). Further, the treatment of seedlings with the precursor of ethylene ACC in the presence of glucose resulted in a "gin" phenotype, while eto1 and ctr1 mutants show glucose-insensitive phenotype (Zhou et al., 1998). However, dark-grown seedlings of gin1, unlike ctr1 and eto1, do not show the triple response, indicating that these signaling pathways play a different role in seedling development. The "triple response" phenomenon—inhibition of normal root geotropic response, inhibition of root and hypocotyl elongation as well as exaggerated apical curvature, first recorded in pea (Neljubow, 1901)—was critical in identifying ethylene signal transduction mutants of Arabidopsis. Interestingly, over expression of the C-terminus of EIN2 also resulted in many constitutive ethylene responses but not the triple response (Alonso etal., 1999). In contrast, the ethylene-insensitive mutants etr1-1, ein2, ein3 and ein6 exhibit phenotype similar to glo mutants (Zhou et al., 1998; Rolland et al., 2002). Genetic analysis of the gin1/etr1 and gin1/ein2 double mutants places GIN1 downstream of the ethylene receptor (ETR1) and EIN2 (Zhou et al., 1998; Rolland et al., 2002). Sucrose or glucose may induce senescence via induction of ethylene production (Philosoph-Hadas et al., 1985). Thus, the role of sugars in senescence/PCD may depend on other factors, such as the presence of other plant hormones. Glucose signaling has been shown to be linked to the ethylene transduction pathway (Zhou et al., 1998). Induction of senescence by sugars is covered more extensively in Chapter 15. The complex nature of multi-hormone cross talk influencing senescence/PCD is also illustrated by the following studies on interactions between ethylene and auxin. These two hormones interact to affect root growth, root hair differentiation and elongation, apical hook formation and hypocotyl phototropism (Swarup et al., 2002). Auxin induces ethylene biosynthesis in many plant species primarily by elevating the steady-state level of ACS4 mRNA, a member of the ACC synthase gene family (Beckman et al., 2000; Swarup et al., 2002). In Arabidopsis, ACS4 is up regulated by auxin—the ACS4 promoter contains four putative auxin-response elements (Abel et al., 1995; Woeste et al., 1999). In addition to auxin, brassinosteroids (BR) and cytokinins also regulate expression of the ACS gene family. 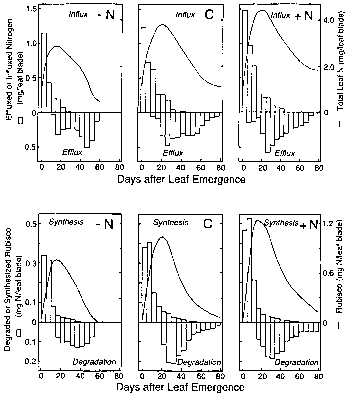 However, there seems to be a complex interaction between ethylene, auxin, BR and light (Yi et al., 1999). Light sometimes induces ethylene biosynthesis, particularly in vegetative tissues, by generating free oxygen radicals, the inducers of PCD. Such a possibility needs to be investigated. The mechanism of the inhibitory and stimulatory role of auxin and ethylene, respectively, in abscission is complex. Ethylene inhibits the movement of auxin (Riov and Goren, 1979) but may also interact directly to affect gene expression in the separation layer (Tucker et al., 2002). Cytokinins (CKs) are generally considered to be plant hormones that are antisenescence in nature. However, CK is known to enhance production of ethylene in many plant species, including Arabidopsis (Mattoo and Suttle, 1991; Cary etal., 1995). Benzyladenine (BA), a cytokinin, increased ACC synthase activity in mung bean hypocotyls (Yoshii and Imaseki, 1981). Although molecular interactions between ethylene and cytokinins have yet to be understood, Lieberman (1979) proposed that some cytokinin responses of seedlings are coupled with ethylene. Low levels of cytokinins induce ethylene production in dark-grown Arabidopsis seedlings and these seedlings exhibit a typical ethylene-induced triple response (Cary et al., 1995). Exploiting this phenotype, various Arabidopsis mutants that do not show the triple response in the presence of kinetin have been isolated. These mutants, designated as cytokinin-insensitive (cin), do not show increased ethylene biosynthesis in the presence of kinetin. Molecular characterization of one of the complementation groups, cin5, showed disruption in a member of the ACC synthases, ACS5, leading to a suggestion that the CK regulates ethylene induction by post-transcriptional activation of ACS5 (Vogel et al., 1998). These authors further demonstrated that the dominant ethylene-overproducing phenotype of eto2 mutation is a result of an alteration of the carboxy terminus of ACS5 that might act as a negative regulator of ACS5 enzymatic activity. Previously, it had been shown (Li and Mattoo, 1994) that the carboxy terminal portion of a wound-inducible ACC synthase (ACS2 gene product) regulates activity and conformation of the dimeric enzyme. Carimi et al. (2003) found that high concentrations of cytokinins enhanced ethylene production, inhibited cell proliferation, and induced PCD in carrot cell cultures and Arabidopsis. However, inhibitors of ethylene biosynthesis did not block these cytokinin responses. It is likely that interactions between ethylene and cytokinins are complex. Although the anti-senescence activity of cytokinins has not been unambiguously demonstrated to be due to inhibition of ethylene production, it is possible that ethylene may lower levels of cytokinins in vivo (Sanyal and Bangerth, 1998). One of the intriguing plant growth regulators is a class of nitrogenous compounds comprising diamines and higher polyamines. Like CKs, they are considered to be antisenescence factors and may inhibit PCD. Polyamines have been implicated in a variety of physiological and developmental processes in plants, including cell division, embryogenesis, root formation, floral initiation and development, fruit development and ripening, pollen tube growth and senescence, and biotic and abiotic stress responses (see Cohen, 1998; Malmberg et al., 1998; Cassol and Mattoo, 2003). Both ethylene and polyamine biosynthesis share a common intermediate, SAM. In vitro studies have shown that polyamines inhibit ethylene biosynthesis in a variety of fruit and vegetative tissues, while ethylene suppresses the accumulation of polyamines (Apelbaum et al., 1981; Li et al., 1992). In short-term experiments, inhibition of ethylene biosynthesis by polyamines results in channeling of SAM into polyamine biosynthesis (Even-Chen et al., 1982; Roberts et al., 1984). Ethylene-mediated suppression of polyamine biosynthesis seems to occur mainly by an inhibition of SAM decarboxylase, a key enzyme in the polyamine biosynthesis. Based on these studies, a hypothesis has been developed: That a cross talk exists between the two apparently antagonistic biosynthetic pathways, namely, ethylene and polyamines, which influences specific physiological processes in plants, particularly senescence/PCD (Mehta etal., 1997). Like ethylene, the polyamine metabolic pathway is highly regulated by a multitude of developmental and environmental signals (see Cohen, 1998; Malmberg et al., 1998). However, the molecular interactions between ethylene and polyamines have just begun to be understood. Mehta et al. (2002) expressed a yeast SAM decarboxylase gene under the control of a ripening-specific promoter E8 to evaluate the role of the SAM metabolic pool in regulating either the ethylene or the polyamine biosynthetic pathway. These studies revealed that the rates of ethylene production in the transgenic tomato fruit were consistently higher than those in the non-transgenic control fruit, suggesting that the polyamine and ethylene biosynthesis pathways can function simultaneously in a ripening tomato fruit. Further, these studies showed that genetically enhanced polyamine levels led to an increase in the carotenoid lycopene, and improved vine life (Mehta et al., 2002). Lycopene is an antioxidant, and its accumulation via enhanced levels of another class of antioxidants, polyamines, raises questions that are important to studies on PCD in a ripening fruit. Interestingly, high-polyamine fruits showed pronounced hypersensitive response (HR) to pathogen attack (Mattoo and Goth, unpublished data). Characterization of genes that are differentially expressed in response to increased polyamine levels should shed light on the molecular basis of cross talk between these growth regulators.